The uncertain future of the Sunday market. 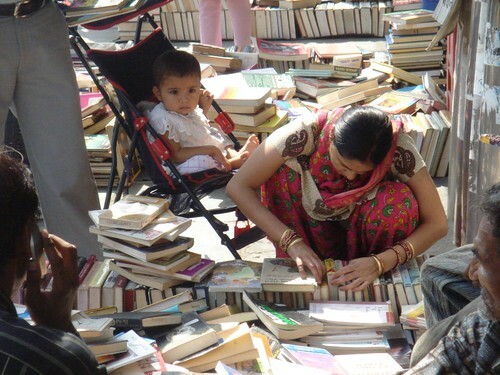 Not all are in love with the Sunday book bazaar in Daryaganj. On June 22nd, 2009, while the Station House Officer (SHO) of the Daryaganj police station was on leave, additional SHO Madan Lal ordered the weekly book bazaar to be closed. The reason: the huge book-buying crowd is said to cause traffic congestion, pick pocketing and eveteasing. It doesn’t help that Municipal Council of Delhi (MCD) has been saying since past few years that the bazaar’s present location is an outright encroaching of the public land. Who could have imagined that the happiness of bibliophiles would be embroiled in a mishmash of issues like pick pocketing and encroaching? That the survival of the only place where most Delhitess get access to rare first editions will depend on MCD? From Delite cinema at Asaf Ali Road to the footbridge at the left turn to Jama Masjid, the mile-long pavement turns into one super-large stall selling everything from pulp thrillers to 19th century encyclopedias. The books here are shipped regularly from as far as the USA and Canada. People come from all over India and even abroad, to pad up their personal libraries. It isn’t the first time that rumours of the bazaar’s closure have surfaced. In 2005, the MCD had wanted to shut down the market for “being an unauthorised affair”. Then a little pull from politicians and a few newspaper quotes by writers like Khushwant Singh (“the bazaar is a real treasure…”) somewhat eased the pressure. However, the MCD intends to move the bazaar to Mata Sundari Road near ITO. But can the book browsing be even half that fun without Daryaganj as the backdrop? “What’s so romantic about Daryaganj,” asks Mr Deep Mathur, MCD spokesperson. “Contrary to notions about the Daryaganj bazaar being 50 years old, it was relocated there from near Jama Masjid just about a decade ago and now we are only suggesting for it to move to a better place.” If that’s what it takes for books to find a home. This is a heart breaking news…. People lets get together, and protest…..if it helps even an iota…. well they might as well move it rather than shutting it down. Even though the Daryaganj book bazaar has been one of the most endearing aspects of life in Delhi for me, we should probably spare a thought for the people crossing the road in buses, rickshaws and cars, who are definitely inconvenienced by the crowds. I don’t see why shifting it to another place, which is obviously better than closing it down altogether, is such a big deal. I am writing to you after reading your article in Hindustan times. I am a Delhi wallah myself and I would like to tell you how wrong you are in your thoughts of supporting such illegal encroachements. Having visited Daryaganj book market not only I am aware of the fact that 90 percent of the books sold in that market are a clear violation of copyright rules but are also a thriving ground for illegal trades. It’s shocking how literate people like you mislead people by giving such articles. Rather than criticizing the SHO you could have suggested some good alternative to the bold and right move by the SHO. If government does anything right it’s one’s duty to educate people how to get on the right path rather than showing them such easy and wrong path just for the sake of publicity. I finally went to the market this Sunday. As expected, it turned out to be nothing special – sure, there were some stalls with really cheap books on offer, but mostly it was like a lot of second-hand sellers one after the other who did not know much about what they had on offer and were only adamant about the price. To all those who have been left unimpressed about Daryaganj- kindly go back to your snobbish bookstores in some posh area of Delhi and (kindly) do not denigrate Daryaganj’s book bazaar.I have much more to say and trying to pen all that I realised it would be better to write an article on it, rather than put up an entry, too gigantic for a comment. Anyone willing to read the article can access it on ‘www.myknottylife.blogspot.com’ .